Our product range includes a wide range of masking tapes. By keeping track with market development, we are offering a superior range of Masking Tapes, which includes floor masking tapes, masking tapes, tissue tapes, cotton tapes, two side gumming foam tapes. The offered tape is comprehensively used for wrapping particular body areas that need to stay free from masking wax paints, etc. 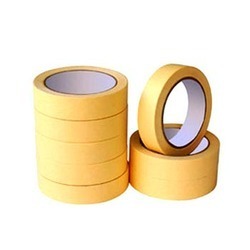 Excellent adhesion, durability and high tensile strength are some features of our masking tape that make these highly demanded in the market.